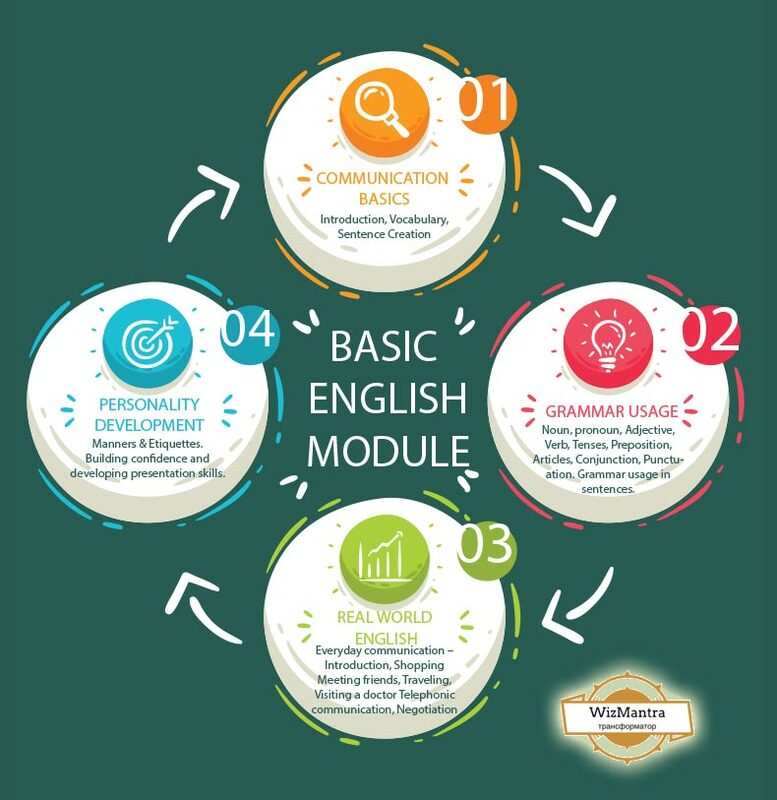 WizMantra Basic English Speaking programme is ideal for individual who needs to enhance their Basic English speaking level skills to boost confidence and get ready to face the world. To be precise, the entire course is designed to help the trainee achieve ability to communicate effectively in real life situations.Our typical course content offers balanced approach to learning the English language while focusing on the skills of speaking, listening, reading and writing English. This spoken English course offers effective learning sessions to students who need to work on their English fluency level, or want to study or travel abroad. With the spoken English class/ course, students can prepare to appear for competitive examinations like banks, IELTS, TOEFL, and PTE. The improvement in the system and old age ways of how government bodies used to work have long gone by. With the hi-tech world and technological advancements, It’s high time to remove hesitation while speaking to English nationals/speakers. WizMantra helps you improve your level of English speaking and enhance your ability to use and speak English with this course. Housewife looking for improvement in English communication or job. Want to help your school going kid learn English? Talk to him/her in the language. Well, don’t be disheartened if you can’t speak fluent English. Our Basic English language course is ideal for beginners like you. In case, you are looking for job or crack your first job interview, this is the course for you. With the advent of digital age, the world has become a smaller place and businesses are done online. However, this makes it mandatory for businessman to remain updated to stay ahead of their competitors. And if they are in the business of import and export, travel opens the avenues to meet new people and do business with them. With this online spoken English course, we give you the opportunity to learn English from the comfort of your home while you get ready to confidently do the business in a foreign land. No matter whether it’s extra-curriculum activities or college programs, you will see a tough competition all around. Let us outshine others with sharper English skills. Whether you are going abroad for higher studies or preparing for entrance exams, hone your English language skills with our online spoken English classes and lay the foundation for a successful career. Our experts work on your vocabulary, grammar, and sentence formation every day online to make you more confident and fluent in English. They lay a solid foundation for a bright career while saving your time so that you can focus on your academic goals. Hi myself, Amarjeet Singh, from firozpur punjab, My experience with WizMantra online classes. WizMantra online classes are Best online institute for learning Spoken English I have completed my basic English spoken module, where I have covered grammar rules and vocabulary part and lots of activities involved, Which cleared my basics of English language. Online classes are very comfortable and no classes room noise 🙂 We can learn and concentrate more because of the individual trainer. My trainer Neha mam was very good and helped me to gain confidence. I am enrolling for the advance module for my spoken English. I found WizMnatra online classes are awesome and prefect place for those people who want to pursue English for their higher studies. In my opinion WizMantra classes provide high level of education and best trainers! Thanks WizMantra for your support! Spoken English is hard to improve if you do not practice with someone who can correct you. My friend suggested WizMantra online classes, who is also doing advance level for there. Joined basic level at WizMantra online classes ,Online classes provide excellent training with dedicated one to one online sessions with the trainer which allows us to speak English like a native speaker , My basic problem was my English fluency and writing skills. WizMantra online classes provide fully conversational Spoken English classes so I was able to practice with someone, I can speak with, different topics given by the trainer are very interesting and I gained knowledge while preparing for that particular topic The trainer gave grammar corrections and vocabulary help too. Not boring theory. I am enrolling myself for next level. I have Joined WizMantra online classes because I want to learn English basics for my job …In my mind, I am always thinking of whether I'll be able to learn English or not, but after joining WizMantra online classes, I feel more comfortable and confident about myself. Trainer mam helped me a lot. Online classes with new methods of teaching are very interesting. I have learnt correct pronunciation and grammar usage.Enrolled myself for intermediate level:) and it is going really well. Hi Everyone Sadik here from Hyderabad. I would like to narrate my experience which changed my life upside down. I was preparing for my final exam where I got to know that my favourite company from Saudi Arabia was coming for placement drive in my college. I was very happy to know about the same and started preparing them for the same. But the main problem was my command on the English language. I was very weak and shy to speak the English language. Therefore I thought of joining classes which could teach me when I want to and in an effective & easy way. I found out about Wizmantra’s Online Job-Seeker’s Program from my friend who got placed after taking that course. So I enrolled for the same course and was astonished to see that it actually provided me value for my money. I would like to thank Wizmantra for helping me out with my English. This made me clear my interview and I am going to Saudi Arabia next month. Thank you Wizmantra. Hiii…. This is Amol here from Pune, Maharashtra. I am very happy to tell you that because of Wizmantra. I am able to understand the basics of English and speak effectively without taking a break. I was wondering how I can improve my English because most of the classes teach in a very theoretical manner to which I was sure I will not be able to learn much if I went to those classes but here at Wizmantra’s English Speaking Classes I saw that they teach you practically and therefore help you at correcting you mistakes which not only help you improve but also build confidence in the same. So what I feel is you should not definitely go for this course if you want to learn English as I am writing in this interview. I would give 5 stars to them to change my life drastically. Thank you Wizmantra. Hi, I am Vicky from Walgaon, Maharashtra. I stay with my family in Amravati where we have a good business. Recently when my business grew I got some customers who were speaking in English all the time and I was not able to understand what they were talking. When I asked one of my loyal customers that why is that English is so important he told me that nowadays English is as important as Working because we are surrounded by English everywhere. So I asked him how he developed himself as an individual in English to which he told me by taking a course. After inquiring I got to know that he joined Wizmantra’s English Speaking Classes to learn English and cultivate himself as a good speaker. Thus after he told me this I joined Wizmantra and now I am able to speak fluently. You should also join if you want to learn fast and in an effective way. Hi, my name is Anuj and i am from Jalandhar city, my school had a very bad teacher and because of that I was not able to score good marks and could not speak English properly. This lead to various problems in my life. My friends used to make fun of me and tease me because of my poor English. One good day my uncle saw me crying on the staircase and suggested me to join Wizmantra's English Speaking Classes. I was not sure whether they will help me or not but I thought of giving it a try. So once after enrolling for the course I was assigned with a trainer who was not only friendly but also very cooperative. Due to his nature I was able to learn and speak English fast & fluently. I would recommend you to go for this course if you want to improve your English. Hi, I am Tej Bhanu Pratap Singh from Ghaziabad, Uttar Pradesh. Today I would like to share my experience with the Wizmantra’s English Speaking Classes Course. The trainer was like my friend and therefore I developed fluency in English at a greater pace. The course was designed as per my need and therefore I was able to adjust the timing of my teachings. So I used to study after my business got over. My Spoken English level was very low when I joined but after taking this course it gradually improved and now I can speak English in an effective manner. Due to the flexibility of course I was able to learn quickly and effectively without any hesitation which not only helped me with my abilities but also boosted up my confidence for English. I would like to suggest anyone reading this to go and definitely try out this course. I was in the dilemma that my weak and poorEnglish will degrade my score in the exam for MBA. But, after getting to know about WizMantra I thought to give it a try, so now I am able to speak English properly and fluently with the WizMantra's English speaking classes. The tutor was friendly and was helpful enough to make me understand and clear my doubts. Whenever I was in need of them, they were always there for me. I liked the way they have made the course for newbies. The best thing I like is that all of the speaking class comes for a value that someone can pay easily. I would definitely like to tell anyone who is reading this review that if you are lost with your English, then these people at WizMantra English Speaking Classes will definitely help you find & get better with your English. You should definitely go to this class if you want to learn as fast as possible. Talking from my personal experience you should once try to join the WizMantra English speaking classes so u will able to understand how exactly English is learned after joining u will able to understand that your confidence level to speak English in front of anyone has gradually increased. Whatever the institute is, expertise if teachers are the core and they build the foundation of the student and the institute. During my course of 5 month courses foe General English and Advance course I went through the guidance of 3 teachers and they all were very humble and extreme supportive. Having graduated as an engineer, I moved to Delhi in 2017 to pursue a career in my stream. Since I was not quite good in English, I found it tough to crack HR interviews in every big company. Not knowing the language made it tough for to find a job in any a good company. It is at this time, I decided to brush up my English speaking skills and I enrolled myself with Wizmantra’s General English Program. The decision to join the class proved quite fruitful as I soon realized improvement in my English speaking skills. The program is ideal for professionals like me who are weak at English and aspire to learn the English in quick time. The training was imparted to me by expert trainer over phone and through Skype. The trainer used to converse with me in English which over a period of time improved my confidence and English speaking skills. I became quite good in speaking the language and within few time landed a decent job as well. Hello friends, my name is Riyaz. I want to share my experience that how a right decision in the course of my learning has changed my life completely. I was a student of a government school in Meerut where all my reading text books were in hindi, I was primarily from a hindi medium school and I had enormous hesitation and problems in English writing and English Speaking. The moment I came here in Delhi after the completion of my 12th, I realize the importance of speaking in my life. I was totally depressed and I started feeling lonely in my college. And this raised me the need to search for English Speaking classes near by Gurgaon, as I was studying in the day time in college and evening I was working in part-time and I had no time to join a physical class near my locality in Gurgaon. And At initial stage I was worried for my success in my career,But the moment I joined the course of WizMantra my life was totally changed But, thanks to WizMantra’s teaching staff as they pumped me up time to time and boosted my confidence level from zero to 10. Within 6 months, Ms Jayanti Joseph and Shruti mam helped me alot to focus on my study and made sure that I should attend my classes on time. Many time they helped me to manage my class timing; I don't have words to thank them. My name is Meenakshi and I was borne and brought-up in Jaipur. I just want to put forward my gratitudes towards WizMantra as it helped me tremendously to improve my English fluency and communication and to learn basic of English. As a housewife, it is always difficult to go out to take a language class. Thanks to WizMantra through which I learned advanced English with optimum ease and convenience that too with comfort of sitting back at the home. Kudos team WizMantra, keep doing the good job. I run a famous antique shop near Kutub Meenar, Delhi and I am going to tell you how WizMatra helped me to grow my business. As my shop is situated near a historical tourist place, travelers from different corners of the world, come in my shop to purchase antique Indian products and other materials. When I started my shop, most of the foreigners returned from my shop as anyone in the shop could not understand what they are asking for. Then, one day I get to know about WizMantra from one of my friends, who is a school teacher. Without thinking much, I convinced my three assistants to learn a language through WizMantra and now I have four different language speakers in my shop including English, French, Spanish and German. And it helped me a lot to develop my shop at a big level. All this happened due to the easy online classes of WizMantra. Many Many Gratitudes to Team WizMantra!!! My name is Suruchi Jha and I primarily belong from Patna, Bihar and just want to share my experience and how WizMantra helped me to gain fluency in English speaking. After my marriage, I had to stay in Gurgaon for 8 months and finally we shifted to Mumbai, I found that the majority of people in our society, usually communicates in English. That is why I was not comfortable to interact with anyone except my husband. One day my husband brought a tablet and introduces WizMantra to me. I have learned a lot with WizMantra and the best part of it is that it uses the easiest ways of learning and starts with fundamental for novices. It also offers different courses for different type of learners. Moreover, there is no restriction of time to take classes and you are not required to travel to take classes. It was a wonderful journey with WizMantra and I am glad to know that institutions like WizMantra still exists. Goodmorning friends; thank you for giving me an opportunity to add my review on this website.The need for English fluency arise when I started looking for my project training in Btech last semester. The search made me to realize the importance of fluency and communication in work-space. Although I was hired to get project training in Detroit Consulting firm Delhi/Gurgaon but it was quite uneasy for me to talk to people in my office.Quickly I raised my worry to my elder brother and without wasting any day he connected me to shruti mam. She helped me to understand the course curriculum and same day I enrolled for Basic English speaking course. And I have no words to thank my trainer Mr. VidyaBhushan who worked hard with me to raise my level of vocabulary, communication and fluency. He is a professor and coach and one of the best trainer of the World. I admire being his student. Thank you wizMantra, my coach and shruti mam. Hi I am Surbhi, I work in Eicher Noida. To me Wizmantra gave me a platform which was mixed with technology and learning. Interesting part was the vocabularies and words which was sent to me by email. Daily I used to memorize and use those phrases in my daily official communications. And you will surprised to know that it helped me to rampup my speed and vocabulary power. More than a session it depends upon students will power to learn any language; and I'll thank my trainer who made me to realize this fact. I will once again thank WizMantra for all their support and coaching. As an introvert, I was always nervous to express myself, especially in front of English Speaking people. I always had thoughts, but can’t find words easily to express myself. And for that reason, most of the people considered me as an arrogant and a guy with over attitude. I remember that my one of the closest friends ‘Rahman’ suggests me to sign up for online language classes. And I find WizMantra, the most suitable for me. Experts herein WizMantra not only taught me how to construct a sentence quickly, but they also helped me to eradicate my hesitation. The online conversation sessions and guidance in conversational English, have transformed me ultimately. Now, I am a confident youngster to whom the sky is the limit. I would say it's value for money..this is the module where you can actually learn english speaking without going anywhere. Thank you for showing me the value of online English classes; initially I was afraid to trust but gradually I was able to maintain the rhythm; thank you to Shruti madam and Deewan sir. Thank you so much for your support and such a responsive and learning program. I was associated for more than 2months and I am glad to have mentor like you. Finally I am free from nightmare of learning English. thanks to Wizmantra for creating wonderful platform to connect students like me with good teachers. Thankyou Joshi sir for your support and guidance.